I decided to make a mini version, so the recipe is for a 6″ cake. I also opted for cream cheese frosting, in an effort to combat the sweetness of the decorations. But since the rock candy is the real star, you can use any white cake/white frosting combo you’d like. Preheat the oven to 375 degrees F and put a rack in the middle or upper third of the oven. Butter three 6″ pans and line with buttered parchment paper. Cream the butter and sugar in a mixer on medium speed for a full 3 minutes until very light and fluffy. Beat in the vanilla extract, then add 1/3 of the flour mixture, still on medium speed. Divide the batter in two. Dye one blue, leaving the other white. 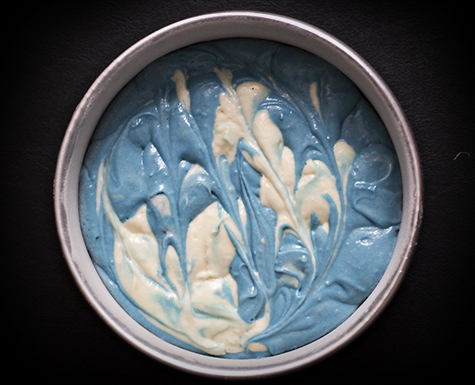 Dollop alternating colors into the cake pans, then gently swirl a knife through. Tap the pans on a counter to level the batter. Bake 20 minutes, rotating halfway through, or until a thin knife inserted in the middle comes out clean. Cool in the pans five minutes, then turn out onto a cooling rack. 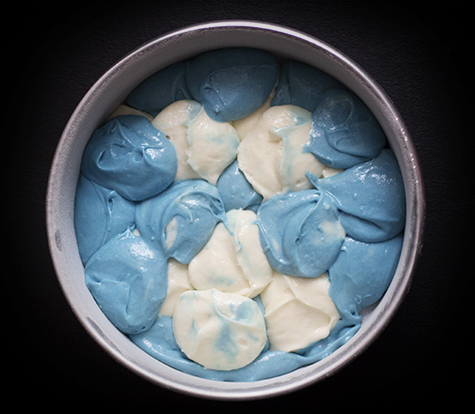 When cold, frost with white frosting, and top with blue rock candy. Entry filed under: Cake/Cupcakes. 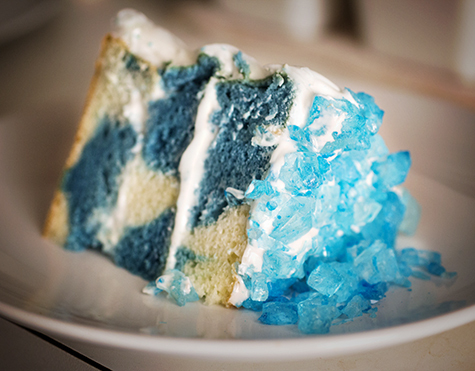 Tags: amc, baking, blue, breaking bad, cake, cream cheese, dessert, frosting, recipe, rock candy, walter white, white cake. 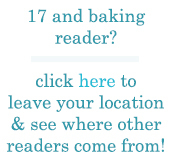 It’s 17 and baking bad, Dad! I’m doing you guys right! Don’t forget that like Walter, your Dad is also a chemist. You got me right away just with the name of your cake! !I’m a fan of Breaking Bad..!It looks so great and the colors are vibrant!! Great post! This is the coolest cake I’ve seen in awhile.. it’s original and looks beautiful. Great job! :) Can’t wait for Breaking Bad to start! Ha! I never thought of comparing cooking meth to baking, but you’re totally right!! Walter would definitely be an awesome baker!! I love everything about this post! 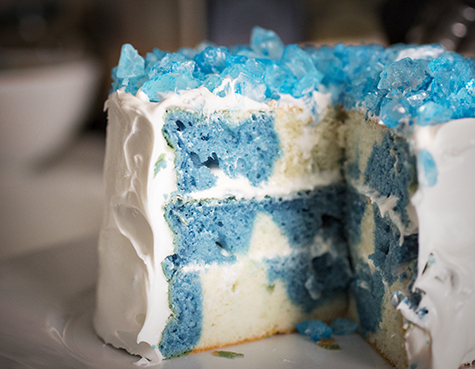 My husband and I love Breaking Bad – I wish I had this cake to eat during the show tonight!! Great recipe, great blog. Congratulations. Downsized, your 6 inch cake recipe suits me perfectly. Such a great themed idea & a beautiful cake. You’re amazing! This cake looks sooo good! Looks really cool! Love the frosting! how did you get the sponge to be so pale? proper cool effect against the blue. definitely going to give this a try! Glad you like it! A lot of plain cake recipes bake yellow, but this one uses cake flour and egg whites only, so the color stays pure. Love this post so much! Wish I had a slice of this cake and some blue rock candy to nibble on during the show last night! This looks fabulous! I love Breaking Bad! I love all the Breaking Bad foods that keep popping up everywhere :) This one is awesome! great post! I’m always having the baking vs. cooking argument. reminds me of geometry vs. algebra. at the end of the day, i just really appreciate the clear logic of baking. cooking, like algebra (for me), was just too abstract and mysterious…. My husband is watching Breaking Bad *right now. * This might be his birthday cake :-) Awesome post! 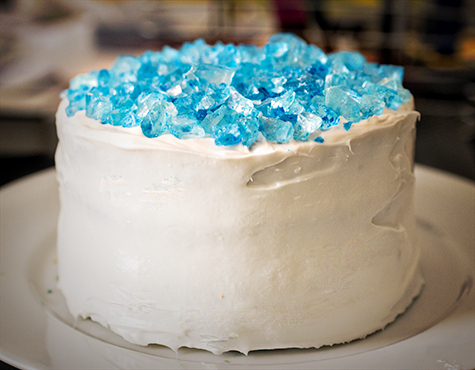 I’m going to make this cake for the finale of Breaking Bad! I like the look of the blue candy on top, looks very fancy! This is awesome! I plan on making blue meth cupcakes for the final episode! PS. So glad you are back and blogging again. Thanks for sharing your story – hope you are doing much better now! Well, darn good job, young lady, but I’m afraid that thing looks like about the least appetizing thing I’ve seen in quite a while. I am not a color person at all, but this blue and white one is after my heart! You are the Danger!!! Now!!!! This cake looks very simple but also very pretty! :) Love this! 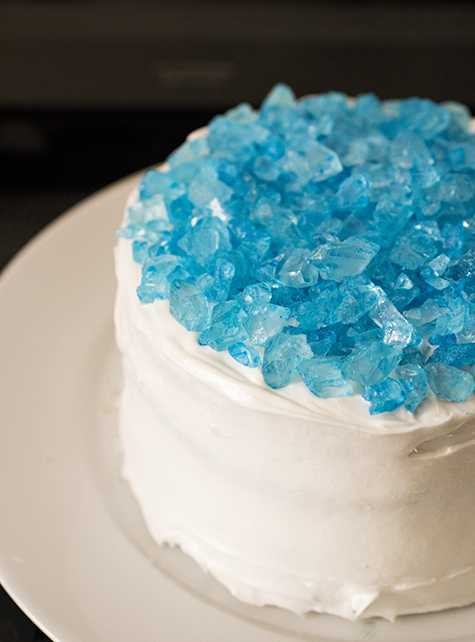 We’re having a Breaking Bad party next Sunday to celebrate/mourn the ending of the series. Mexican food and this cake. Can’t wait. Love this idea! How would you change the recipe for cupcakes? I realized I had only 9 inch pans….so it is a 2 layer cake with smaller layers. Sad. I wasn’t sure of ingredients to make a larger cake…. But hoping it tastes good anyway ;) for tomorrow’s finale. I love your idea for a Breaking Bad cake!!!!! Gunna make this for the finale tonite!!! My best friend and I made this tonight for the Breaking Bad finale and we were so excited because this cake looks so great! Well we made it and it turned out really bad… The cake (3 layers) baked in 6 inch pans were very thin and we almost ran out of mix (we followed the instructions exactly). The marbled effect turned out very nice but the cake was very thin and the frosting tasted really bad, it basically just tasted exactly like sour cream cheese! Why!!! This is so creative! Breaking Bad is one of my favorite shows, as well. My son’s birthday is coming up. He would freak if he had a cake this beautiful (and not made out of the organic, healthy, “boring” ingredients that I cook with on my blog. ;) haha) Of course, I’d have to make mine not meth-themed. Very Creative. Two thumbs up. I made this for my workmates, went down an absolute treat. Only problem I really had was that the icing turned out fairly runny. Is there a way to stop this from happening?